Remember ERS, or energy recovery systems? What those are to an engine, seamless shifts are to a gearbox. The name implies the ability to change gears without allowing the driven wheel to feel any interruption in the flow of torque, something we accept as normal from conventional gearboxes. As we said last issue, the automated manual transmission, or AMT, is popular because it combines all the great attributes of a manual gearbox with the convenience of an automatic. But AMTs also have the issue of jerking the vehicle's passengers a bit in every gearchange. It comes from the momentary gap in acceleration as the automatic clutch breaks the flow of torque - zero acceleration - to make the gearchange. Human beings adapt and we can learn to live with the headnods that come with the gearchanges. But we always try to do better, right? The current best gearchange tech is Syncromesh - once the clutch is engaged, a dog ring (a ring with pegs, that's splined on the gearbox input shaft) slides out to disengage from slots for those pegs (aka dogs) on the running gear's cog. So the dog ring has to move on to the next dog on the next gear you've asked, and then the clutch is disengaged so that drive can resume. During this time, while the clutch was engaged, the engine continues to convert perfectly good fossil fuel into smoke and heat. Look at the actual amount of fuel wasted. An average fast gearchange is about half a second, normal humans might take a second or two. But when you consider how often we're crawling in traffic and shifting between first, second and neutral, the wasted fuel adds up. Seamless shifting is possible already, of course. 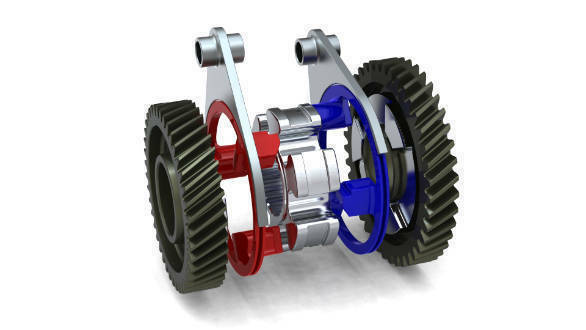 Torque convertors and CVTs (continuously variable transmission) already offer seamless shifts using planetary gears or step-less gearing, respectively. But these complex solutions target smoothness over efficiency, they're slow, and expensive.The dual clutch gearbox uses two clutches so that two gears can be in use at the same time, one primed for use and one actually driving the car. The switch from one clutch to another happens so swiftly and smoothly that the change of ratio is seamless. Again, a complex solution, expensive, and heavier than conventional gearboxes. An ideal seamless shift gearbox, then, should be as simple as a manual, as fast as a dual clutch, as smooth as a CVT or torque converter at the price of an AMT. We want our cake, we want to eat it and then be able to take the whole cake home also. Possible? Now, yes. A company called Zeroshift says it's done it. The idea is simple. Think of a two-speed gearbox (pictured), first gear on the left and second gear on the right - the cogs. In the middle, the seamless shift magic replaces syncromesh. It uses a central ring with shaped nubs that is splined on to the gearbox shaft. In red and blue are the two shift selection rings that are controlled by your gear shift selector. These rings have 'lugs' that Zeroshift likes to call bullets that do all the work. Notice that one side is flat and the other is oblique. That allows each ring to work sort of like a ratchet. So when you're in first, the red ring is engaged fully, the flat surfaces on the bullets drive the gearbox shaft positively. The blue ring sort of coasts. There is spring pressure on the blue bullets but it achieves nothing, and wastes very little energy. When you select second gear, you move the blue ring inwards, pushing the bullets forward. It takes just a moment before the straight face of the blue bullets starts driving the second gear cog (and then the gearbox shaft). The first cog, thanks to the oblique face on the bullet can continue to spin at its original speed but drive is now through the second gear. To the driver, there isn't any delay or gap in the torque since the engagement is instant and the unselected gear - still spinning at its original speed - doesn't affect the driven wheel in any way. There is the potential for some jerks to come from the bullets working, but computer controlled gear management takes care of this. Zeroshift claims that these gearboxes are simple, reliable and faster than any automatic currently in production. And since they're a single-clutch design, they'll be cheaper and lighter as well. Proven technology? This is the Aprilia MotoGP team's gearbox of choice since 2015 ,while Honda and Yamaha both developed their own versions too. How fast is this? MotoGP reporters analysing the sounds of the engines report that the Honda gearbox, for instance, can change gears within 0.09 seconds which is essentially seamless to the rider. The advantage? You can change gear almost anywhere at the racetrack you like, including at full lean because torque flow to the rear wheel is, wait for it, seamless.